Homage and life career award for the following guests: Oliver Stone,Willem Dafoe, Julien Temple, Olivier Assayas, Cristi Puiu, Bruno Monsaingeon, Sergio Castellitto and Valeria Golino. Feature Film Contest, Italian Premiere. – Third and last, after Los Angeles and Cannes, promotional evening for Twin Peaks 3, with David Lynch himself (22nd June). Section in homage to great authors or exponents of history of the cinema. The festival hosted Oliver Stone, Willem Dafoe, Julien Temple, Olivier Assayas, Cristi Puiu, Bruno Monsaingeon, Sergio Castellitto and Valeria Golino. Each guest has been honored with a personalized project, however with each of the guests it’s been organized at least one gala evening for conferring the career award of the festival (and, in the cases of Dafoe and Mansaingeon the honor of Giacomo Puccini’s Foundation) and a masterclass. Masterclasses are priorly organized in the morning, within the section Educational, in order to favor the participation of every order and grade school, to which activities are always offered for free. Feature Film Contest, Italian Premiere. First edition of the contest was made in 2016, in which 12 movies were presented. Half of them was presented as an Italian preview in Lucca and screened again in Viareggio, the other half instead, presented in Viareggio as a preview and screened again in Lucca. In 2017 the contest has maintained the same layout, but the selection has increased to 14 films. The winners at Lucca Film Festival and Europa Cinema Director, Anocha Suwichakornpong won the Best Film Prize (3000 Euro value) of the 2017 Lucca Film Festival and Europa Cinema International Feature Film Contest with Dao Khanong – By the time it gets dark, a reflection on the tragic and bloody repression of the Thai students’ protest in 1976. The Professional Jury formed by Cristi Puli, Angela Baraldi and Pietro Reggiani also awarded a special mention for Best Photography to the film Dayveon, directed by Amman Abbasi. The first Jury of University Student awarded the newly created Best European Film prize to Butterfly Kisses, directed by Rafael Kapelinski, which also received the honorary mention of the Popular Jury, organized for the first time in 2017. Short Film Contest. The Jury of the long-standing International Short Film Contest created by Cristina Picchi, Claudio Capanna and Cristina Grosanè, this year awarded the Best Short Film Prize to Death in a Day by director Lin Wang and a special mention to Movements Arising from Different Relationships/Between Regularity and Irregularity II by Masahiro Tsutani. Section of out-of-competition Feature Films in Italian premiere. This section was created in 2016 with a selection of 3 out-of-competition movies. Two of these movies were firstly screened in Lucca, then in Viareggio, while the third was screened as a preview in Viareggio, then shown in Lucca. In 2017 this section has presented a selection of 7 important premieres. World premiere of Gianni, un film directed by Alberto Tempi. European premiere of The Headhunter’s Calling by Mark Williams (with the presentation of Willem Dafoe). Italian premiere of L’altro volto della speranza by Aki Kaurismaki (with the presence of the leading actor, Sherwn Haji), Keith Richards: the origin of the species by Julien Temple (included director’s presentation), Personal Shopper by Olivier Assays (included director’s presentation), Mal di pietre by Nicole Garcia, Danish Sculptor in Pietrasanta by Jacob Jorgensen. Section Cinema and Music. As always, music has played a key role in Lucca Film Festival. Among the not-to-be-missed events of 2017 edition, the live interpretation of Yasujiro Ozu’s with the Maxxi Museum in Rome. A chamber-music ensemble performed the soundtrack co-written by Maestro Fulvio Pietramala and Maestro Gian Paolo Mazzili, taking into account traditional Japanes pentatonic scales achieving oriental texture and acoustics using original instruments. The film was screened using the façade of (the) Teatro del Giglio as a backdrop and Maestro Mazzoli directed the Boccherini Institute Ensemble. Like every year guests that are particularly bounded to the music world, to the opera and to Puccini too, have been interviewed inside Giacomo Puccini’s native house in Lucca and interviews such as “Oliver Stone’s Music”, “Julien Temple’s Music” and “Bruno Monsaingeon’s Music” were born. Section Educational. The main container of actions specifically targeted to the formation of the public school is the Educational section, which provides free entry for schools during all festival mornings. Through an important collaboration with Lucca’s UIBI Foundation (www.fondazioneuibi.it) the festival broadcasts the program of the Educational section to many teachers of all school of Tuscany region. Generally the program is sent at least one month before the festival, so that teachers can carry out the necessary organizational practices. Every activity in the Educational section has places reserved for schools, but all activities are open to the general public as well. The program is composed of four main sections: 1) Frontal lessons on topics related to the world of school, art and society related to the history of the cinema, through special video clips editing (held by teachers at the University of Florence). 2) Film and documentary screenings with introduction and Q&A by the director or workshops involved). 3) Young Factory project. Since 2016 the festival has demonstrated/pay particular attention on promoting Tuscan young directors, with a sub-section of “Educational”, entitled Young Factory. In this section a group of under-25 filmmakers experienced one or more jobs each, during three different mornings of the festival, with a special participation of kids from secondary school of the Province of Lucca and Pisa, including a class about to accomplish just a short film, showing how the festival can be a time of public education and stimulus for starting the trial of the film medium. 4) Masterclass and conversations with great authors and actors. Exhibitions. 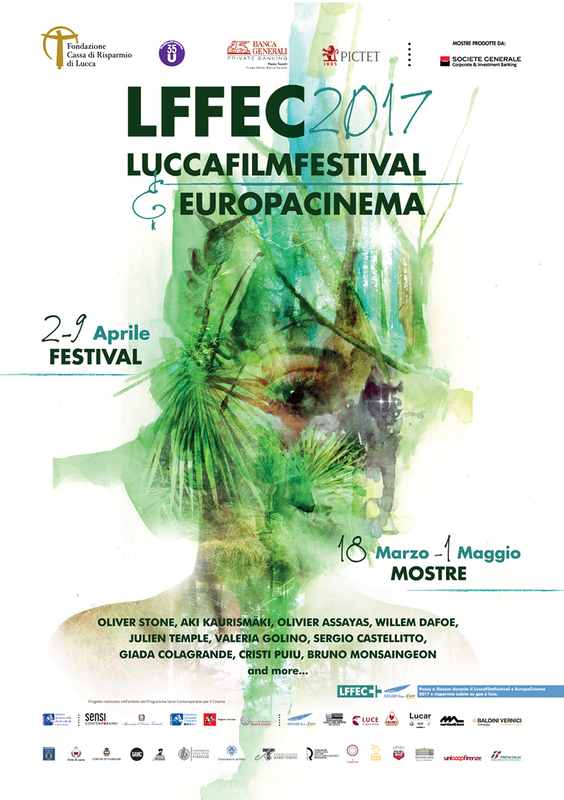 Three this year’s exhibitions for the Lucca Film Festival and Europa Cinema, curated By Alessandro Romanini. The first, titled PunkDadaSituation, and inaugurated on April 3 at the Fondazione Ragghianti di Lucca with the international testimonial Julien Temple, linked together three anniversaries that changed the history of the last century: 1917 with the birth of the Dada movement, 1977 with that of Punk and 1957 With the formation of the International Situationalist Movement. With the second show Il viaggio di Mastorna. Il sogno di un film messo in scena, curated by Alessandro Romanini and Francesco Frigeri and produced by the Experimental Center of Cinematography of Rome, Lucca Film Festival and Europa Cinema 2017 has paid homage to Federico Fellini, giving life to his never-made film and proposing, from 18 March to 30 April at the GAMC of Viareggio, the scenes execution charts, as if everything was ready to shoot the new film of Rimini master. The students of the Scenography and Costume Course, after a scrupulous analysis of the script, have drafted sketches and technical drawings of the environments and costumes of the characters, translating all this into images that have been exhibited in the form of 50 executive boards of the various scenes Film, with the supervision of Professor Francesco Frigeri and the teaching body of the stage course. In addition, some costume sketches from the costume course with the supervision of Maurizio Millenotti were also shown. The show had its own soundtrack, made in collaboration with the students of acting and sound, which accompanied the visitor throughout the course.The third exhibition, entitled Dèi d’Acqua, was finally dedicated to young photographer and filmmaker Joakim Bernardo and was set up at the “Olio su Tavola Gallery” in Lucca. Section Effetto Cinema Notte (Day for Night). It is a particularly interesting and original section of the festival created with the purpose of paying homage to movies icons of cinema, film that will be soon screened in theatres, great actors and directors who are our guest by recreation of expanded cinema. They are literally live events taking place inside and outside business in the city centre, with screenings, performances, costumes and sets to honour the films chosen together with the directors and actors attending the festival. On each night of the festival, some businesses put on stage the performance prepared in order to pay homage to the film they are paired with, whereas on Saturday of the closing weekend of the festival all the performances together will be open and active for the whole late afternoon and night, so that the city will be turning into a big open-air set. On Saturday is put on scene also the main event with performances linked to a guest of the festival, created and produced by the festival. This year the city was divided into five different areas and 42 movies have been matched with an equal number of The main novelties of this section in 2017 are the creation of the award for the best scenography and the award for the best performance. The award for the best scenography, worth of 1,000 euros, has been assigned to one of the retail businesses participating to the section, while the award for the best performance, worth of 300 euros in supply of artistic materials, has been assigned to one of the theatre, dance and music company, which have performed with a performance linked to one of the 42 movies honored by the section. To assign these two awards, a new jury has been created (made up of a journalist of an online and paper newspaper present in the Province of Lucca), which has proclaimed the restaurant “Gli Orti di via Elisa” the best scenography consecrated to the topic of Alice in Wonderland and has awarded it with the award “Effetto Cinema Notte Best Scenography”. Indeed, the award for the best performance went to the theatre company “Kreativa teatro” for the performance “Women on the Verge of a Nervous Breakdown”. The other undisputed winner of Effetto Cinema Notte 2017 has been the newborn superhero PlasmaMan, who has been realized by the festival, together with Fratres, in order to start an innovative campaign of sensibilization for blood donation and which, before coming back to the festival 2018, will be used as testimonial throughout the national territory. This year, the Main Event was “Oliver Stone’s War Zone”, on Saturday, April 8, in Piazza del Giglio which began at 7 p.m. and featured two concerts at 11.30 p.m. and at 12.30 a.m. dedicated to three-time American Oscar winner. A representation conceptually inspired by Oliver Stone’s war films and by the various historical scenarios it has crossed over the years to narrate how war – in the end – never changes. The films “Alexander”, “Platoon” and “Born on the Fourth of July” were the protagonists of the “War Zone”, brought on stage thanks to the collaboration with singer Emma Morton and the historical group in costume “Simmachìa Ellenon – Hellenes’ Alliance”. The audience enjoyed a medley of songs from the soundtracks of the chosen films, film images were screened on the facade of the Teatro del Giglio, while “the Macedonian army” performed various military maneuvers inspired by the times of Alexander the Great in the main square. 360°. In 2016, the festival opened up on this new field of linguistic experimentation and made the first 360° short film about Lucca. In 2017 the festival was the first in Italy at filming its own activities at 360°, making shots freely accessible to everybody. Focus. It is the only new section born in 2017, dedicated to show projects in their different stage of development, of feature films linked to the territory. For this first year 3 trailers of productive project of the territory have been presented.